Aalayam - Colors, Cuisines and Cultures Inspired! : The Magic of Kalamkari! 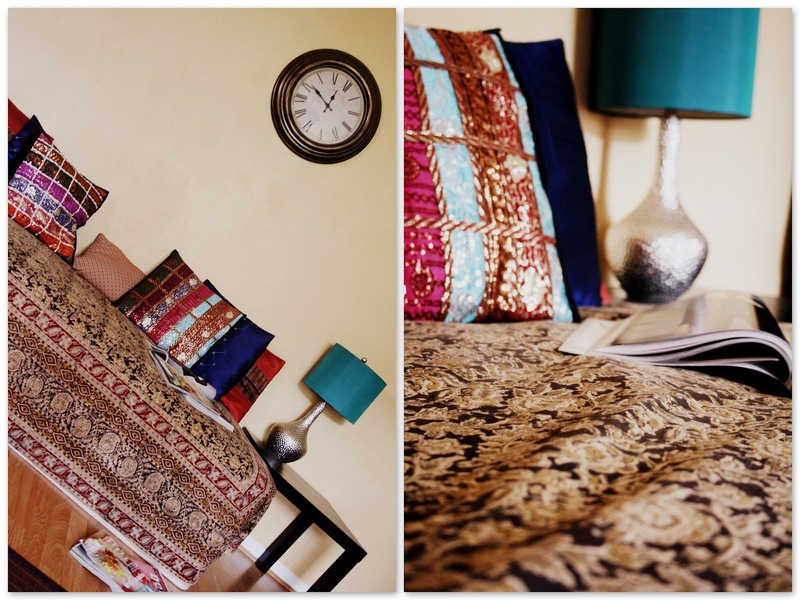 I grew up in a home adorned with Kalamkari..Seetee covers, cushions, shirts, dresses and sarees..so much..that I have taken this much loved hand painted/block printed cotton textile, sourced from Pedana near by Machilipatnam in Krishna district, Andhra Pradesh, for granted...as an essential part of my life and living space. The familial response that the fabric art evokes in me is not surprising, as I see this fabric used with global seasonings and versatality. World designers and decorators have embraced this fabric to add a dash of earthy splendor to their collections, homes and works of art. The word "Kalamkari" is derived from the Persian words kalam (pen) and kari (craftmanship), meaning drawing with a pen. Two distinctive styles of kalamkari art reign supreme- the Srikalahasti style and the the Machalipatnam style of art. My father is from Machalipatnam and this particular style of fabric is something I hold dear to my heart. A piece of home..wherever I am. The sheer versatality of the fabric is tantalizing. Clutches, Purses, Handbags, Scarves, Home Decor, Paintings and Table Cloths. I even have coasters made with this fabric and print. The beautiful hues, the vibrant textures and the organic, hand made quality of the print..where no one design mirrors the other..the textured imperfections..the fragrance of the fabric..make any Kalamkari piece, a work of art to be cherished. I am always amazed by the sheer talent of Indian craftsman/women. The rich fabrics and colors and unbelievable amount of creativity in using the fabrics/materials is mind boggling! I LOVE those orange clutches. Me too!! Thank you for your comments and for browsing through our blog. 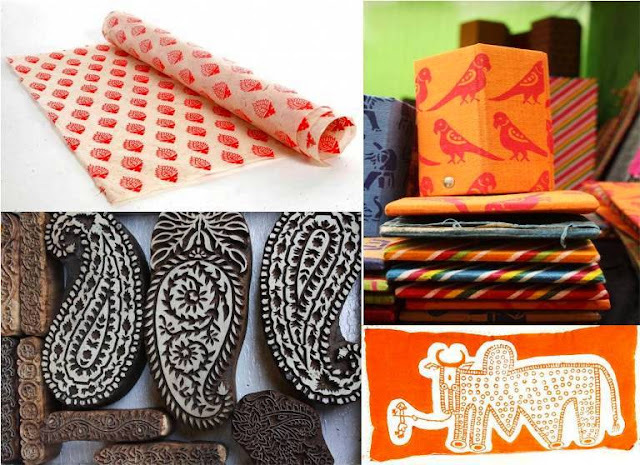 Watch out for more spotlight and feature posts on fabulous Indian art forms - handmade with love! I have a pair of lovely Kalamkari stools! How lovely! Where did you get them Vandana? Thank you Bindu! It is our pleasure to share our creative zeal with fellow bloggers like you! Welcome to the Aalayam family!! 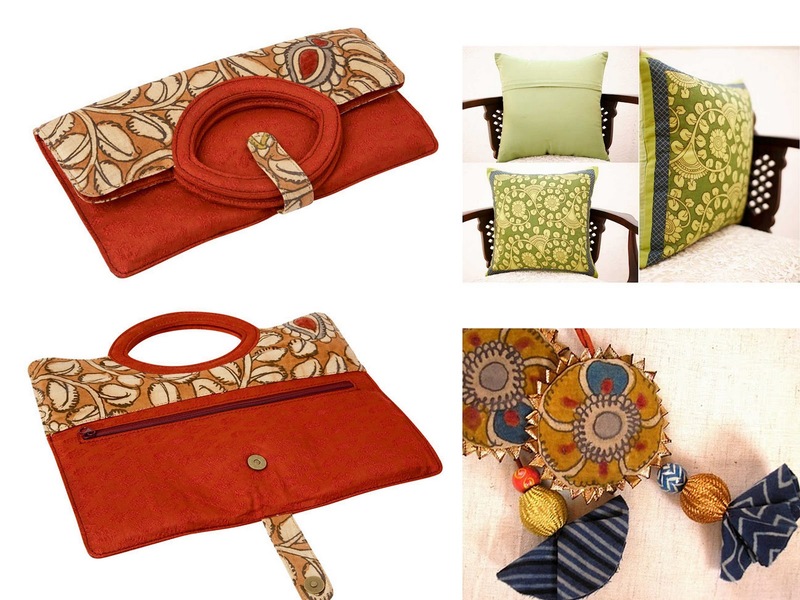 Great collection of artistic work of kalamkari in one place, showcasing some of the finest products of kalamkari. Nice blog Kalamkari Sarees . 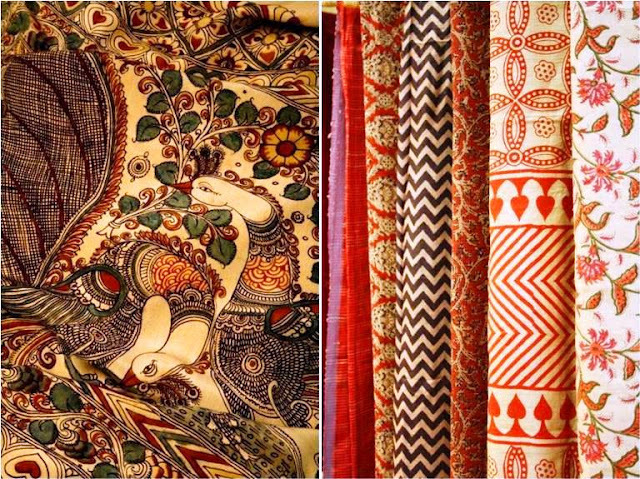 good write-up on kalamkari sarees!